Great Range Capital congratulates and welcomes a new addition to the Apple Bus Company team; Mindy Johnson, Chief Financial Officer. 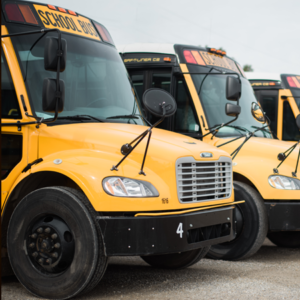 Apple Bus Company has been a part of the Great Range Capital portfolio since March of 2016 and is a leading provider of school bus transportation services. Please see below for the complete announcement as published by Apple Bus Company. Apple Bus Company announced today the appointment of Mindy Johnson to Chief Financial Officer. CLEVELAND, MO – Ms. Johnson has over 20 years of financial leadership and corporate management experience working across various industries. Ms. Johnson joins Apple Bus from AdParlor, a digital media buying and creative services provider, where she has served as Chief Financial Officer since 2016. Previously, Ms. Johnson was Senior Vice President of Finance at AdKnowledge, an advertising technology provider, and Director of Financial Planning & Analysis at MIQ Logistics (former YRC Logistics), a global logistics solutions provider. Ms. Johnson began her career as a CPA at Deloitte, followed by positions with NovaMed and Sprint. She holds a Bachelor of Science in Accounting from the Missouri State University. Apple Bus is a Kansas City area-based transportation company with operations in eight states. Apple Bus is large enough to provide the highest level of service and at the same time small enough to be aware of and responsive to school’s needs. It is the mission of Apple Bus Company to set the standard for safety, quality of service and quality of product by which all other transportation providers are judged.